On a dark Tuesday night before Christmas, YMCA St Paul’s Group invited our friends at the Kingston Young Carers’ Project to an informal party in the Pod. The young carers were invited to bring their parents/relatives and siblings along to the popular soft play at YMCA Hawker, where they could play, chat and have some party snacks. Among the invited were also Diane White, Manager of Kingston Young Carers’ Project and Liz Grimwood, who is a Senior Young Carer Support Worker with the Kingston Young Carers’ Project. The Kingston Young Carers’ Project is a Royal Borough of Kingston Voluntary Charity, which supports young carers aged 5 to 18. The children are referred to the charity from the families themselves, and by support workers, children’s social services and the local schools. Liz is in charge of organising the activities for the young carers, which this Christmas included ice skating, a splash party and cooking. “We have a base, but not really a space,” she explains. “That’s why we try to partner with other charities and organisations, like YMCA LSW, who deliver children’s services. The young people really love coming to the Pod!”. 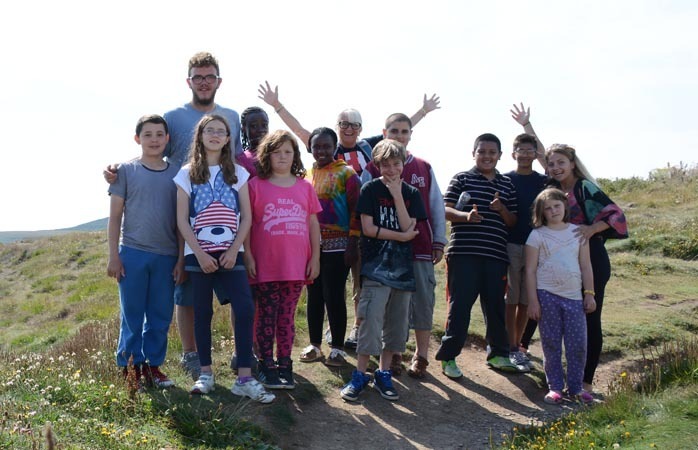 Some of the young carers at the Pod party took part in this summer’s Residential Camp to Wales, which was funded and organised by YMCA LSW, in partnership with RBK and the Kingston Young Carers’ Project. Among the ten young carers who went on the Residential Camp was 12 year old Olivia, who was really happy to meet up with Camp Leaders Myke and Victoria again at the party. She also loved the photos they had displayed all over the Pod, of the children at the Camp doing different activities. Another young carer who had an unforgettable week away at the Camp in Wales was Milad. He came to the party in the Pod with his mum Nazma, his dad and brothers. “Milad benefited so much from the Camp,” Nazma said. “He has become more independent and a bit more willing to try new things. The Camp was the first time Milad was away from his family. I told him to call me whenever he wanted to, and he did give me a call once a day, but all he usually said was ‘I’m fine and I’m busy mum, I’ll talk to you later! When he came back from the Camp, he said he missed his ‘family’ – referring to the Camp leaders Myke, Victoria and Liz. I think it was nice for him to get some time away from his family and his brothers, where he could get some time to himself. Also it was good to be away from screens and be outdoors,” Nazma says. Liz says that after the young carers came back from the Camp, it was clear that they had had an amazing time and lots of fun. “You could see it in their faces!” she says. “They had definitely conquered some fears and they got on so well with the YMCA staff. Victoria, especially, was important, because she was like a mum to them, who comforted them if they were homesick and let them call home if they wanted to do that”. Diane adds that “the residential camp to Wales with YMCA LSW was unbelievable, it was an opportunity they would never have had if it wasn’t for the YMCA. The young carers formed amazing relationships with each other and with the staff”. People don’t always understand what a young carer is, and there are many myths about what it means to be a young carer. According to Diane, a young carer is “someone who helps provide care to somebody in their family with an illness or condition”. She says: “This is obviously a very wide definition and it can be a sibling, a parent or a grandparent. It does not mean they are the sole carer in the family, who do all the cleaning, cooking and caring, but rather that they have a family member whom they worry about. Also, it often means their family situation is such that they miss out on a lot of activities their peers take part in”. “The children we work with are a strong community, who take strength from each other. They give each other support at school as well, because unfortunately, some young carers experience being bullied”. Diane says there is a need for more volunteers in the Kingston Young Carers’ Project, and that if people want to help, they are welcome to send her an email. The Kingston Young Carers’ Project do more than organise activities and outings for the young carers. They work closely with the whole family, Diane says. “We provide whole family support, and try to build their resilience. We also offer peer support groups and workshops, and one-to-one mentoring. We are also specialists in parental mental ill health. In addition, we run a weekly youth group and a monthly group for the younger children”.